Triple view system allows you to view your weekly calendar plus your monthly agenda and to do list all at the same time. The weekly format features quarter-hourly appointments into the evening, seven days a week, and QuickNotes® column for priorities. The monthly format features a full month on left page and QuickNotes® area on right page with eight-month calendar reference. Triple view system allows you to view your weekly calendar plus your monthly agenda and to do list all at the same time. The weekly format features quarter-hourly appointments into the evening, seven days a week, and QuickNotes® column for priorities. 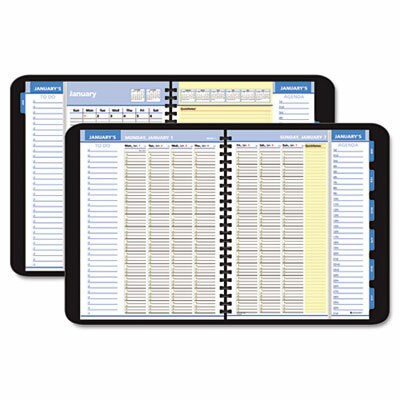 The monthly format features a full month on left page and QuickNotes® area on right page with eight-month calendar reference.